(Nanowerk News) Portable electronics — typically made of non-renewable, non-biodegradable and potentially toxic materials — are discarded at an alarming rate in consumers' pursuit of the next best electronic gadget. The research team, led by UW-Madison electrical and computer engineering professor Zhenqiang "Jack" Ma, described the new device in a paper published today (May 26, 2015) by the journal Nature Communications ("High-performance green flexible electronics based on biodegradable cellulose nanofibril paper"). 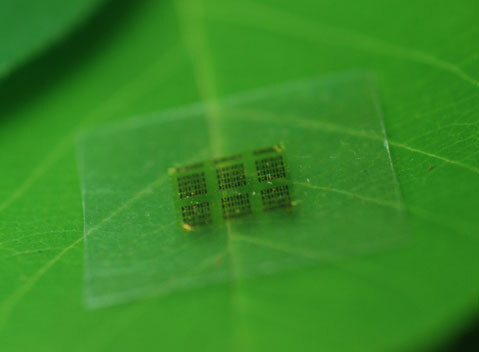 The paper demonstrates the feasibility of replacing the substrate, or support layer, of a computer chip, with cellulose nanofibril (CNF), a flexible, biodegradable material made from wood. A cellulose nanofibril (CNF) computer chip rests on a leaf.